As I’ve mentioned before, Google+ has become a place for businesses and brands to set up shop and interact with their customers. Google is making sure that these folks have everything they need to not only engage with fans, but eventually turn the actions into actual sales and traction. Today, the company has announced a pretty long-awaited feature for both versions of its Google+ mobile app, Page management for administrators. Finally. But it’s not perfect, more on that later. Today we’re rolling out v3.2 of the Google+ app to Android and iOS; both versions include one of our most highly-requested features: support for Google+ pages. This gives page owners the ability to post, comment, and interact with their followers directly from their mobile device. This is a pretty big deal, because up until now, brand managers had to use the web or mobile browser version to manage all of their pages. In some cases, like the NFL, there are quite a few sub-pages within its brand. This is the same thing that Facebook went through with its own Page offering, and eventually split out the experience into its own native app. I personally appreciate Google’s attempt at making account-switching super simple, except they didn’t fully bake the feature. 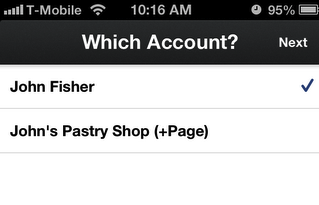 Yes, unfortunately, there’s no part of the app that lets you switch to a page once logged in. You have to log out and then back in to do the switch. Ugh. Of course, companies aren’t the only ones managing pages, as plenty of people have set up ones for charitable causes, or specific topics that they’re interested in. I find it nice that Google managed to update both iOS and Android versions at the same time, keeping the experience consistent…for the most part. Additionally, you can now edit your posts on the iOS version, which is now finally iPhone 5-friendly. Its Android counterpart sports an updated widget and a revamped “Find People” section. Obviously, the widget is Android -specific for reasons, but I’d like to see iOS get a similar Find People experience. But back to this whole brands thing. I think that other companies are getting attention for how they’re building their stable of media and brand partners, but Google has quietly leveraged its huge roster of AdSense customers to get going on Google+. This is a massive opportunity for the company, which is on a mission to infuse social into all of its products. As far as I’m concerned, the UI of the Google+ app on both platforms creates an impressive experience (minus this latest omission) that doesn’t feel like you’re using a Google product at all. That’s not a stab at Google, but let’s be honest, you wouldn’t exactly describe the company as an iOS development shop. Looks like the times are a changin’. If only they would put this mobile team on the native iOS Maps app…I mean, if it were to exist.